Hawaii's islands are surrounded by reefs filled with 435 species of fish. The small brightly colored fish range from 3 inches to 2 feet. Oddly enough, if you go to the grocery store here on Moloka'i you will only find a handful of types of fish, like ahi tuna, mahi-mahi, onaga, ehu, opakapaka, and akule. So when a neighbor gifts you with fresh reef fish, it's a rare event, mostly because locals usually catch just enough fish to feed their families. 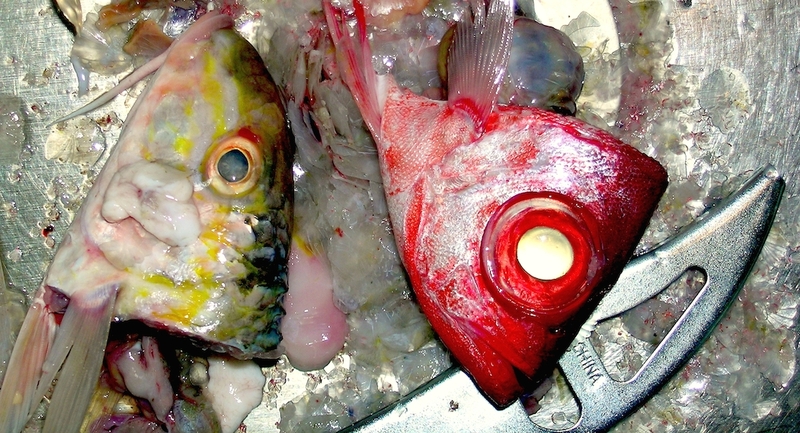 The fish shown above, or what's left of them, are Weke‘a (yellow-stripe goatfish) and the red head is `äweoweo (Hawaiian Bigeye). Weke‘a are a popular food fish here in Hawaii. There are 10 species of goatfishes native to Hawaiian reefs, but no known general Hawaiian term for all goatfish. Care should be taken not to eat the head of certain species of this fish, the brain reputedly contains toxins which cause disturbed sleep, nightmares and hallucinations. The `äweoweo, which means "glowing red", is endemic to Hawaiian waters, living under ledges and in caves, and reaches 12 inches in length. It has a delicate white flesh that is delicious. Naturally when someone is nice enough to share their catch with you, it's important to get it cleaned for dinner as soon as possible. It's best to do this outside so the fish scales don't fly all over your kitchen. Cleaning fish is really not a pleasant thing, but if you don't do it... who will? You will need a cutting board, sharp knife, and a fish scaling tool like the one shown above. Some people just use a butter knife. You can leave the head on, but I personally don't like what I am eating starring at me, so remove the head and guts, then start the scaling process by scraping from the tail to where the head used to be. Once all of the scales are removed, rinse the fish in cold water and refrigerate in a container with crushed ice until you are ready to fry them. These small fish were highly esteemed in early Hawai‘i and were eaten broiled, cooked in ti leaves, raw or salted lightly for two or three days, then cooked. Personally, I like to season them lightly with salt, garlic powder, and Old Bay seasoning, then coat them with whipped egg. Finally cover the fish with corn meal and fry in a wok or deep frying pan in a canola, or peanut oil until crisp. This process is very simple and only takes about 10 to 15 minutes of cooking, which leaves you with a deliciously crispy crust. Serve with thinly sliced Japanese cucumber and slivers of sweet red pepper that have been marinated in seasoned rice vinegar and salt. This simple salad is delicious with fried or heavy food. Naturally some fresh lime slices will be needed for garnish.